Andy Selva – San Marino’s national hero! On the first day of September 2017, as the autumnal chills were beginning to wrap their cold fingers around football fans watching their teams progress – or otherwise – through the qualifying programme, chasing a place in the 2018 World Cup in Russia, Michael O’Neill took his Northern Ireland team to the Stadio Olimpico di Serravalle in San Marino. They returned with a comfortable 0-3 victory. On the face of it, the result was probably one of the easiest to predict of the evening’s international fixtures across the globe. San Marino are, after all, one of the weakest of the Fifa family members, being placed at 204 in the August 2017 rankings with only the British Virgin Islands, of the teams with any ranking at all, beneath them. Until Gibraltar were admitted into Uefa in 2013, they were also European football’s smallest competing country, as defined by population numbers. All that said though, there’s just the slightest of chances that perhaps the result may have been different had the home team been able to call on the services of their most capped player and top scorer. Unfortunately, the man in question was injured and unavailable. When you’re the only player in the history of your country’s footballing exploits to ever have scored a winning goal whilst wearing the national colours, you’re going to carry a little prestige with you, even if you are at the ripe old age of 41. In fairness to O’Neill’s team, the men in green were on a heroic run of form at the time and, truth be told, would in all likelihood still secured the victory even if their opponents were able to call on a full roster of players. Every team misses their top scorer when unavailable though, and San Marino were surely no different. Andy Selva was born in Rome on 25th May 1976. Despite his birthplace being the capital of Italy, having a Sammarinese mother meant that although his chances of ever being selected for to play in the famous Azure shirt of the country of his birth were slim, he could enter the international arena under the colours of La Serenissima. He would do so with distinction. Selva began his playing career in the 1994-95 season amongst the undistinguished surroundings of the regional fifth tier of Italian football, somewhat inappropriately named the Eccellenza (Excellent) with A.S. Latina scoring five goals in just over two dozen league appearances. It was hardly a record to set the pulses racing, but deemed sufficient to interest Civita Castellana, who strutted their stuff in Serie D, one league above where Latina played. In his one season with the Lazio-based club, he returned an impressive 10 goals in 31 league games. Continuing the upwards momentum, he then moved to Fano, who played in Serie C2, and remained with the Granata until March 1998. It seemed however that perhaps Selva had reached beyond his level at this exalted height. For a number of reasons, he only played just a couple more games than in his single season with his previous club, and scored just a single goal. It was the least productive period of his career, and even compared poorly to his record playing in international games for San Marino. Ironically, it was while with Fano that Selva first received international recognition. Called up for the San Marino U21 side, he played against Turkey, and despite a 1-4 home defeat, netted his team’s only goal. The following year, he made his full international debut, and scored his first goal for his country netting from 12 yards in a 1-4 defeat to Austria. He wouldn’t trouble the international scoring records again until 2001. Selva was offered an opportunity to redeem his domestic league reputation the following season with a move to another Serie C2 club, Catanzaro. He may have found the Cantabrian air more to his liking as he rehabilitated both reputation and form. He found his shooting boots again and delivered half-a-dozen goals in a less than outstanding season by the club in which he made 40 league appearances. Although an improvement on the goal record at his previous club, it may well have been the case that at this stage of his career, it would be wise to take a step backwards, in order to pick up some more forward momentum. A move back to the Eccellenza with Tivoli fitted the bill. Back facing the more accommodating defences of the regional league, 15 goals in just 21 league matches was still a worthy achievement. It would lead to a move to a city where Selva would enjoy the most celebrated moment of his career, although not whilst wearing his club’s shirt. San Marino Calcio are based in Serravalle, the nominal capital of San Marino, near the Apennines Mountains, and Selva’s move to his maternal homeland also meant that he would play his club’s home games at the somewhat inaptly named Stadio Olimpico. His club career in Serravalle was however was hardly successful and he returned just four goals in 26 league appearances during the 2000-01 season. It would mean an inevitable moving on, although the following season was a peripatetic one, even for a player who had already played for half-a-dozen clubs in just seven years. The 2001-02 season saw Selva play for no less than three different clubs. After three appearances with San Marino without troubling the scorers, he moved down the east coast of Italy and turned out five times for Serie D club Maceratese, scoring once, before being shipped out on loan to Grosseto in Tuscany where a further 15 league games and two goals saw out the season’s play and wanderings. Somewhat ironically, that season of travelling between three clubs, also saw a landmark in his international career. On 28th February 2001, San Marino faced a difficult – given the paucity of their resources, there a few games that aren’t difficult – World Cup qualifying game in Belgium. Although perhaps not at the same level as the Red Devils’ current crop of world stars, the Belgian team of the time was more than capable of handing out a sound defeat to the smallest of European football’s minnows, and did so scoring ten goals, and conceding just one. That single strike for San Marino though came from Andy Selva. Scoring against the Belgians would become a nice habit for the striker. The game was well into the ninetieth minute and the home team had sated themselves by hitting double figures of goals a couple of minutes earlier, when San Marino were awarded a free-kick on the edge of the Belgium penalty area. Sizing up the opportunity, Selva clipped a right-footed shot over the wall and into the top corner of Deflandre’s net. It meant little in the context of the game of course, but made Selva his country’s all-time top marksman. He became the only player in the history of San Marino football to score more than one goal for his country. It was an honour he would retain until 2012, when Manuel Marani scored against Malta to give San Marino the lead in a Friendly home game against Malta. They lost the game 2-3. By this time however, Selva had stretched his total at the top of the San Marino international goal scoring charts to eight. Four months after the drubbing in Brussels, Belgium played the return fixture in Serravalle. This time they only won by 1-4. The home goal was, of course, scored by Selva. The Belgians had threatened a repeat performance of their home victory sweeping ahead with just ten minutes on the clock, when Marc Wilmots fired home. Inside sixty seconds though, a rare foray forwards by the home team saw a ball squared to Selva who coolly slotted the ball into the net for the equaliser. The home players celebrated the unexpected goal with appropriate delight and enthused by the strike, held their illustrious visitors level until just before the hour mark. Three goals from there though, by Gert Verheyen, Wesley Sonck and another by Wilmots gave Belgium a comfortable victory. In 2003, Selva moved clubs again, this time joining current Serie A club Società Polisportiva Ars et Labor, more commonly known as SPAL. Although recently promoted to Serie A after being crowned Serie B Champions in 2016-17, at the time of Selva’s arrival, the club was languishing in Serie C1. He stayed with the Biancazzurri for two seasons playing just over 50 games and scoring an impressive 22 goals. It was during his time in Emilia-Romagna that his greatest claim to fame came to pass, and a game that made him a national hero took place. Unsurprisingly, despite the meritorious result of a 1-1 draw in Latvia thanks to an equaliser on the hour mark by Nicola Albani, San Marino had finished rock bottom of the qualifying table for the 2002 World Cup, although Selva’s two goals against Belgium had placed him in joint fifth place for top scorers in the group, alongside such luminaries as Croatia’s Robert Prosinečki and Davor Vugrinec. Such an accolade is probably tempered a little though by the inclusion at the same level of Scotland’s granite centre-back Colin Hendry. All that was behind them now though, and on 28th April 2004, San Marino played a Friendly game against that other perennial whipping-boy of European football, Liechtenstein, at Serravalle’s Stadio Olimpico. Although perhaps a minnow to most other European countries, the team from the Grand Duchy were still pretty big fish compared to the home team. Selva was captain of the team by now, and with six minutes on the clock, the home team was awarded a free-kick on the edge of the visitors’ penalty area. It had been a full 38 months since Selva had netted his goal from a similar position in Brussels, but with what appeared practised ease, he clipped the ball over the wall and into the net to give San Marino a lead they wouldn’t relinquish in the remaining 84 minutes and, to date, a unique victory in the footballing history of the country. It was also one of only three occasions to date where they had not conceded a goal. Their best other results were three draws. Aside from the one mentioned against Latvia, they also shared the spoils away to Liechtenstein in a 2003 Friendly and at home to Estonia in a qualifying game for the 2006 European Championships. They had lost every other one of their games. The following year, towards the end of the 2004-05 season, San Marino entertained Belgium in a qualifying game for the 2006 World Cup. In the eleven months since the victory over Liechtenstein, San Marino had played five games, losing them all and conceding 18 goals without netting a single one in return. Belgium had become Selva’s personal favourite opposition though and had scored in both of the games San Marino had played against them with him in the side. Could he deliver again? Of course, he could. Timmy Simons had put the visitors ahead with a penalty after 18 minutes, but just ahead of the break Selva performed the oracle again and netted his third goal against Belgium and the fifth for his country. Belgium would score again to secure the victory, but the Red Devils’ defence had seen enough of Selva by now. Three months later, the footballers of Bosnia and Herzegovina would have some sympathy with the Belgian backline and goalkeeper. Arriving in Serravalle for the next game in the qualifying group, they left with a 1-3 victory under their belt, but the home fans had been warmed by celebrating a long-range goal from the country’s top marksman to bring the home team back into the game at 1-2. Despite, or perhaps because of, this success and fame, Selva moved to Padova for the 2005-06 season. It was however a short stay in Veneto. After scoring only two goals he was transferred to another current Serie A club who were experiencing less successful period in Serie C1 at the time, Sassuolo. Back in the north of the country, he enjoyed a successful period scoring 23 goals in just under 60 games across a two-year period and played a key role in their breakthrough season when they achieved promotion to Serie B under the stewardship of Massimiliano Allegri, who would later go on to much more success. Selva enjoyed success of his own and was top scorer in Group A of Serie C1. It was during his time with the Neroverdi that he scored his seventh and eighth goals for San Marino. 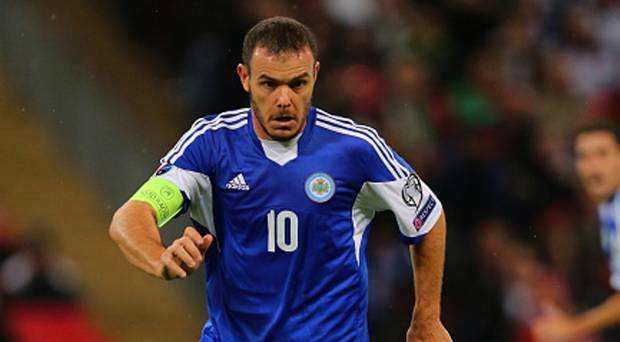 Almost two and a half years had passed since his goal against Bosnia and Herzegovina, and in that time, across 14 games San Marino had conceded no less than 70 goals, losing every game and the only goal to their credit had come in a 1-2 home defeat to the Republic of Ireland, when Manuel Marani scored the first of the two goals for his country to date. When Wales visited Serravalle though, Selva would end his international drought. Entering the last fifteen minutes of the game Wales were two goals clear, but a free-kick against the visitors by the edge of the penalty area invited Selva to perform his party piece. He duly obliged, but Wales held out for the victory. Twelve months, two defeats and 13 goals conceded later, San Marino entertained Slovakia in Serravalle. By now Selva was 32 years old, but still the most automatic of selections for his country. As was now becoming the norm, San Marino were two goals down when Selva struck. Taking possession out on the left flank, he cut inside a defender and sent a curling shot into the far corner of the net. Again, as was the norm, it did little to affect the result of the game and a third Slovakian goal tied things up. After leaving Sassuolo in 2009, Selva moved to Hellas Verona for two years, but was released by the club when they achieved promotion to Serie B. It seemed that most of the clubs he plied his trade at saw Serie B as a bridge too far for Andy Selva, especially with his aging legs. Eight goals in 29 league games for the Gialloblu suggested there was life in the old dog yet though. From 2011, when he left Verona, Selva has played for another three different clubs and, at the time of writing, at the ripe old age of 41 is with S.P. La Fiorita, who finished Group A of Serie C1 as champions in 2016-17. Some may say that it’s relatively easy getting an international cap for a small country that has such a small pool of talent to select from, and there may well be some truth in that. Becoming top scorer for that country though, with currently a total standing at four times the amount of his nearest rival rather diminishes any such charge levelled against Andy Selva. No-one can say who may come along in the future to challenge Selva’s record for San Marino, but given the history to date, it may well be a while before another such talent pulls on their international shirt. Until such time, Andy Selva will stand head and shoulders as San Marino’s outstanding player. For a small country, yes, but certainly a true national hero. (This All Blue Daze article was originally produced for ‘The Football Pink’ website).